Parents make a difference in the lives of children. 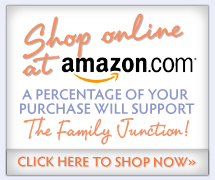 The Family Junction makes a difference in the lives of parents. We understand that parenting is the most important job a person can have, and all families face parenting challenges at some point in their children’s lives. At The Family Junction, parents connect with other parents who understand the wonderful, yet sometimes difficult, responsibility of raising children. Our parenting programs offer practical and effective parenting advice in a fun and relaxed atmosphere . . . because families matter! © 2019 The Family Junction, Inc. • All rights reserved.